The boys have been loving Christmas videos lately. I'm not sure what the deal is. Between The Wiggles "Santa's Rockin" and The Wonder Pets "Save The Nutcracker" and "Save the Reindeer," if I wasn't wringing the sweat out of my hair, I might wonder if I should start getting the Christmas decorations out. 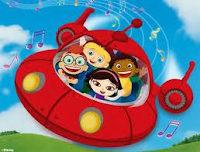 The past couple of weeks though, they've allowed a new show into the list of favorites - the Little Einsteins. It has the same aspects that Dora, Diego, and the Wonder Pets have that the boys love so much - each show has the same outline and repetitive songs. When the Little Einsteins decide what they are going to do, one of them says "We've got ............ a mission!" And AJ will throw his arm up in the air and shout "a mission!" We are just thrilled to have another show to put in the mix. So we are desperately DVRing every single episode on TV and hitting all the Goodwills and thrift stores, searching for DVDs. Wouldn't you know, the one DVD we have right now is the Little Einsteins "Christmas Wish." And we watch it every day.